To protect the bears as well as humans, only people who win a lottery are given permits to access the viewing area. No more than 10 people are allowed in at a time, and once at the viewing site all are confined to a small 10'x10' gravel viewing pad. 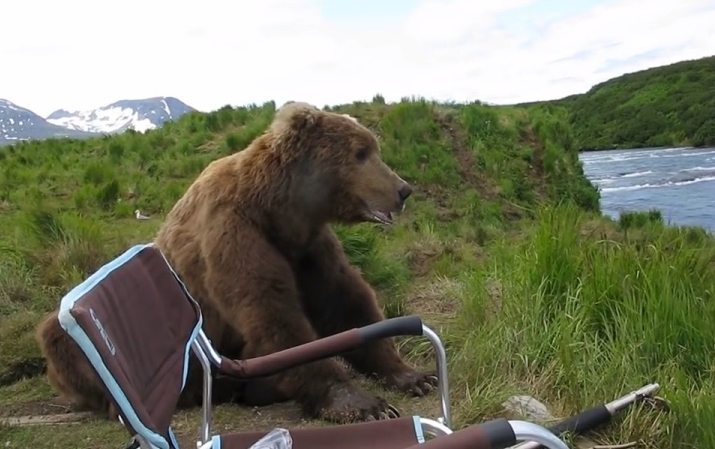 Responses to "It's Alaska: Curious bear calmly sits down next to photographer"
Wonderful. Kudos to the photographer for maintaining calm. Just think about it. He has no cubs to protect. He's not hungry. There's plenty of food in front of him. Yeah, I would say the photographer was relatively safe. But I know me..."nice bear. Nice bear. Don't eat me". He even gently scolded the bear ("hey-ey-ey-ey!") and the bear turned away! Haha! "Heya, what up dude. Nice view Im just gonna sit over here..."
That's amazing. However, the smell in my pants would have caused him to leave much quicker. I would have made it ease for him. I would have had a heart attack!